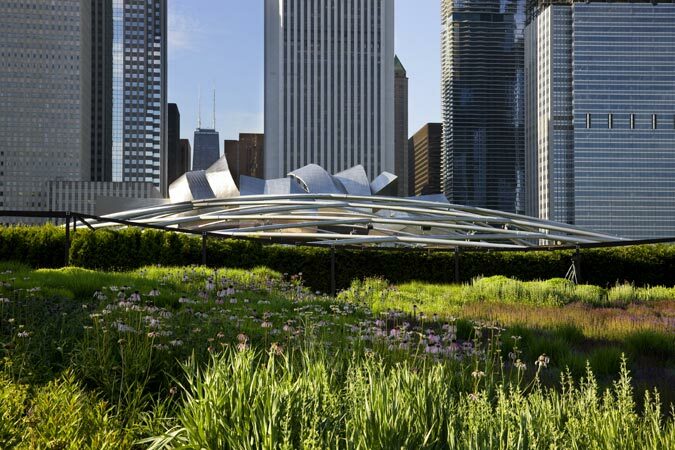 The gardens of Millennium Park frame the Chicago skyline and the Jay Pritzker Pavilion. After 21 years as mayor, Richard M. Daley has left an indelible mark on Chicago’s built environment. The Architect’s Newspaper asked 11 Chicago architects to reflect on Daley’s impact on the city’s architecture, planning, and landscape, and to ponder the challenges facing the next mayor. A green roof atop Chicago's City Hall (top), and new housing at the site of Cabrini Green. 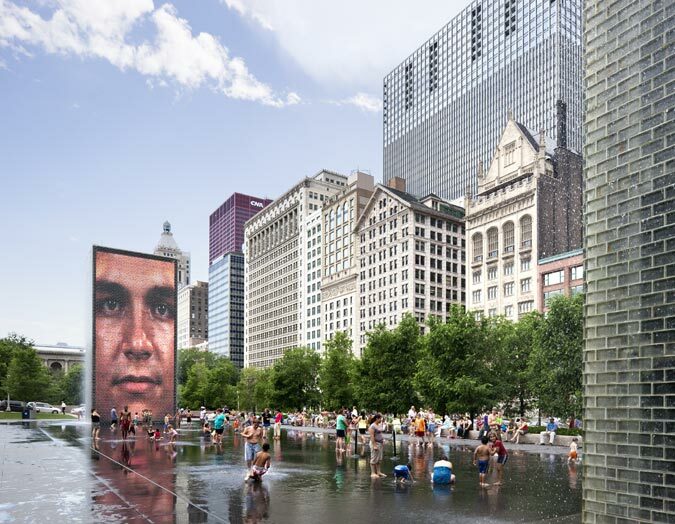 Millennium Park's Crown Fountain by Spanish artist Jaume Plensa draws a crowd. 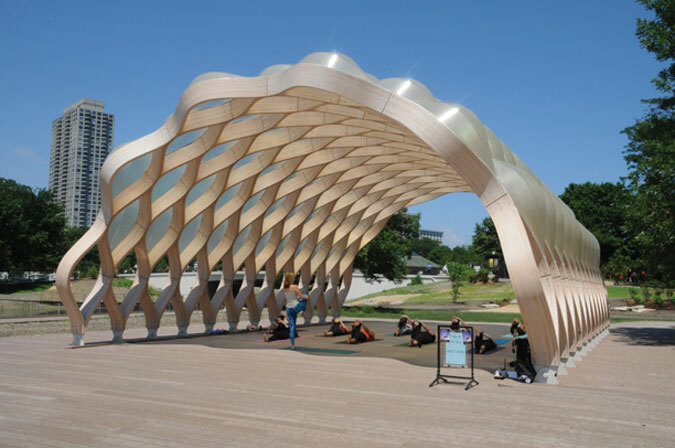 A yoga class takes place inside Studio Gang's new pavilion in Lincoln Park Zoo. The pavilion glows at twilight, reflecting off the Zoo's neighbhoring pond. 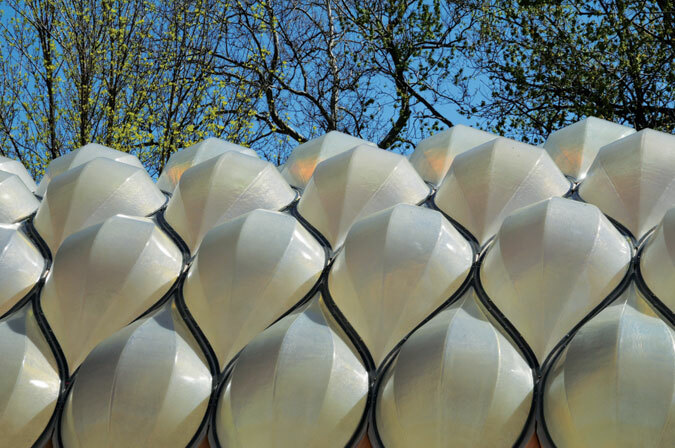 After putting ripples in the Chicago skyline with its award-winning Aqua Tower in 2008, architectural firm Studio Gang added one more curve to the city this spring with a pavilion at the Lincoln Park Zoo. Part of the studio’s $6 million renovation of the Zoo’s South Pond, the pavilion is built of prefabricated wooden planks milled into parabolas and joined together at their ends, creating a loosely woven pattern that arcs from one edge of the boardwalk over to the other. 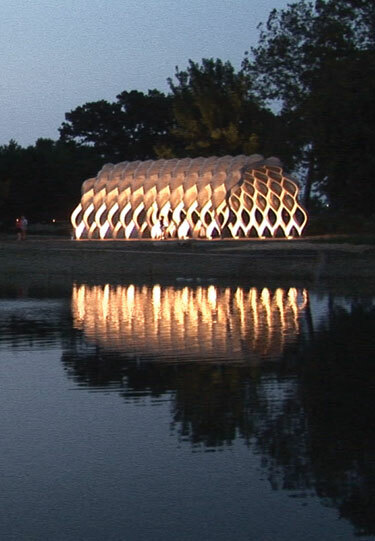 Translucent half-pods are set into the negative spaces created by the frame, giving the pavilion the feeling—fittingly, for an aquatic habitat in a zoo—of a tortoise shell. They also provide shelter from the elements, turning the pavilion into a popular space for community meetings, classes, and recreational activities like yoga. The pavilion sits on a boardwalk encircling the four-acre pond, which Studio Gang converted from a shallow, manmade pool fed by city tap water into a natural, self-cleaning habitat that doubles as an educational exhibit. Especially at night, with floodlights illuminating it from below, the pavilion beckons pedestrians from across the pond, drawing them along the boardwalk and through its arc. Translucent pods have been set into prefabricated wooden planks. Magellan's Lakeshore East from the air. 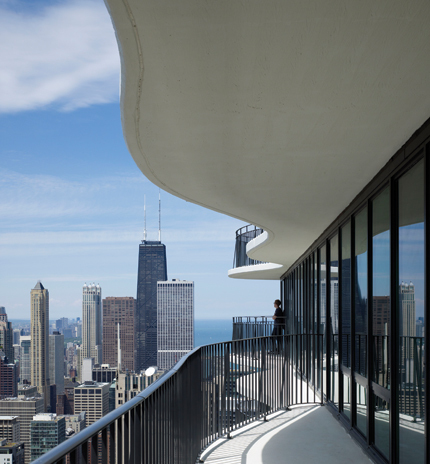 The undulating balconies of Aqua are the newest landmark on the Chicago skyline, and the building has cemented Studio Gang’s reputation as one of the city’s leading high-design firms. It has also signaled the ambitions of the project’s developer, Magellan Development Group, as one of the most innovative and design-minded in Chicago. 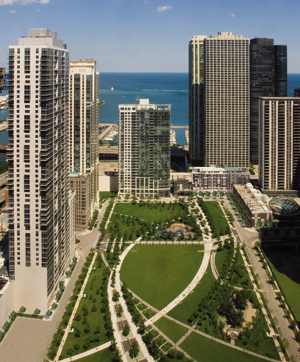 A 6-acre park at the heart of lakeshore east will eventually be ringed by 5,000 units of housing. the parkhomes at aqua, designed by studio gang. According to Loewenberg, the build-out of Lakeshore East is on schedule, with eight of the 13 major buildings completed. Though the most recent buildings are smaller scale, such as the Studio Gang–designed townhouses known as the Parkhomes at Aqua, the market is picking up again. “There has been a dramatic turnaround in the last 60 to 90 days,” he said. A new building, likely rentals, is in the works, designed by Brininstool, Kerwin and Lynch (BKL), a firm in which Magellan is an investor. “The condo market is still fractured, but rentals have improved dramatically here,” he said. A condominium building by Arquitectonica is on hold until more financing can be secured. “It will come back,” Loewenberg said of the project. Loewenberg believes that the location of Lakeshore East has made it a durable investment even during the downturn: Aqua is 85 percent sold, and the other buildings are performing just as well. 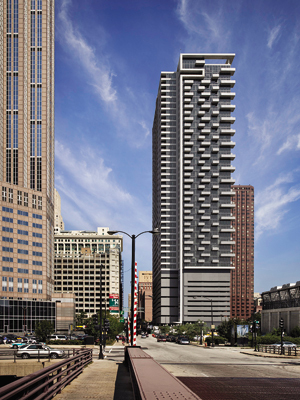 And, the developer adds, Lakeshore East’s prospects look strong to banks. “There’s a lot of lending interest out there,” he said. Even as the firm works to complete Lakeshore East, Magellan is looking for new opportunities in the Chicago area and beyond. Through working on a proposal for the athletes’ village for Chicago’s Olympic bid, Loewenberg formed a relationship with Thomas Kerwin, who was then working for SOM. When Kerwin decided to join David Brininstool and Brad Lynch in starting a new firm, Loewenberg sensed there was an opportunity for further collaborations. 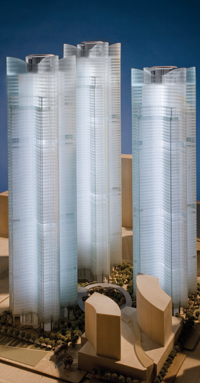 An architect by training and a principal of Loewenberg Architects—also affiliated with Magellan—Loewenberg believes the company’s relationship with BKL will allow it to pursue development opportunities abroad (Kerwin has extensive experience on large-scale projects in Asia from his time at SOM). “It’s a part of the natural evolution of things. They’ll go after a project on their own, and we’ll pursue things together when it’s appropriate,” he said. Back at home, Magellan is working on a proposal for a grocery store, retail center, and parking garage to be built on a surface lot in the Ravenswood neighborhood. Smaller projects like these are part of Magellan’s pragmatic strategy. The company has a strong relationship with the owners of Roundy’s Supermarkets, and realized that the site, close to transit lines and a compact residential neighborhood, was ideal for a grocery tenant. The company is waiting for approval for tax increment financing funds from the city. “We’re always looking for opportunities,” he said. CMK's 235 Van Buren, in foreground, designed by perkins + will. a profile and detail of 235 van buren. With 1,977 units and $1.1 billion in construction under their belt, CMK Companies can hardly be called an emerging development firm. Founded in 1995 with a few single- and multi-family projects, the company quickly gained the confidence of lenders, allowing them to move up to larger projects. 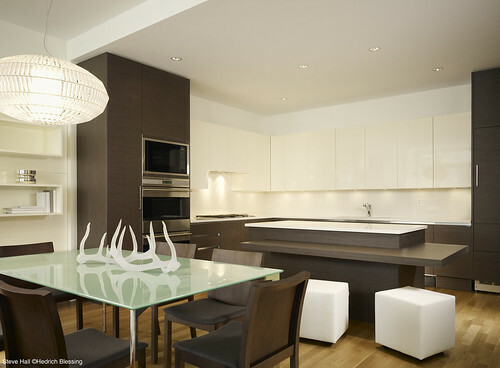 A commitment to contemporary design runs through all their work, which quickly and steadily began to attract buyers. Scott Osterhaus, principal of Osterhaus McCarthy, who worked on a number of smaller and mid-scale projects for CMK in the late 1990s as well as more recently, said Kihnke was a good client from the start. “He was looking for something that was interesting and more modern than was the norm in the speculative market. He’s always been a bit of an architecture buff,” Osterhaus said. He believes Kihnke not only connected with buyers but also helped to push residential design forward in the city. 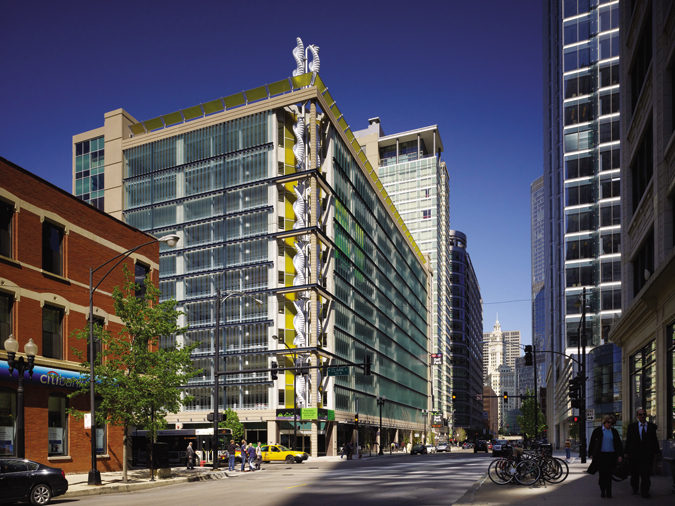 Aside from Johnson at Perkins + Will, CMK has worked with Brininstool and Lynch (now Brininstool, Kerwin and Lynch) on large projects including 1620 and 1720 Michigan Avenue in the South Loop, both of which are sold out, and John Ronan on the renovation of the company’s offices. Ronan has also worked on a project in the Turks and Caicos in the Caribbean that has yet to break ground. The Greenway Garage, developed by Friedman Properties and designed by HOK. With its restaurants and showrooms, lovingly converted old buildings, and busy new hotels, it’s easy to forget that River North wasn’t always a nice place to live, work, or go out at night. “Fifteen years ago, this place was blighted. People thought we were crazy,” said Robert Lopatin, chief operating officer of Friedman Properties, one of the principal forces behind the area’s renaissance. “Now it’s the hottest area in the city.” The company manages more than 50 properties, many in River North, with a total of more than 4 million square feet of holdings. 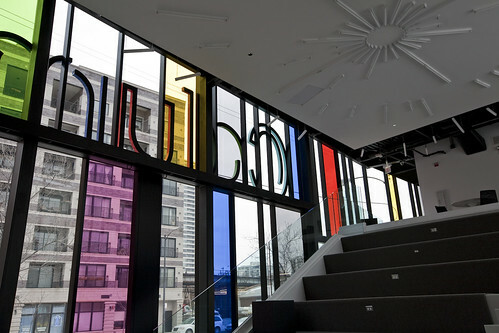 Through historic preservation projects—like the conversion of Reid Murdoch Center from a warehouse into a combination of office, retail, and restaurant spaces—and new construction, Friedman has been a leader in turning the area into a vibrant, and highly sought after, mixed-use neighborhood. With many buildings converted to retail and restaurants with office space above, River North has also extended Chicago’s central business district beyond the Loop. the Greenway garage's green roof will connect to a new 40-story residential tower next door. “Albert Friedman has been truly innovative. 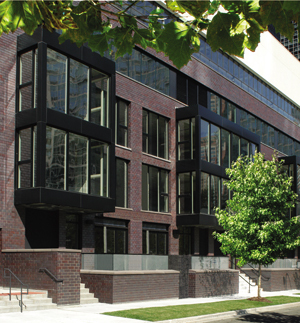 He started buying up properties in River North in the ‘70s, and began creating value out of classic old buildings,” said Todd Halamka, design director of HOK Chicago, referring to the firm’s president and founder. “He has a good eye for design, and a commitment to well-crafted buildings, and he understands the importance of human, street-level scale.” HOK has worked with Friedman on a number of projects, including the recently completed Greenway Garage. The sustainably designed garage shows the company’s commitment to adding contemporary new construction to its extensive portfolio of rehabilitated properties, as well as its continued belief in mixing uses and adding urban amenities. 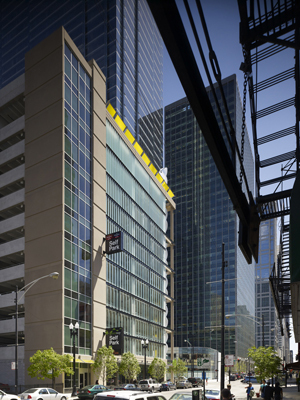 Built on the site of a former surface parking lot, the garage has ground-floor retail and a multi-story corkscrew wind turbine at the corner, which will generate enough electricity to power the garage and even supply a couple of electric car–charging stations. Cisterns collect rainwater, and the building will have a green roof that will be accessible to a new 40-story residential tower next door, developed by AMLI with Friedman. According to Lopatin, vacancy rates are very low and new businesses, especially restaurants, continue to open in the neighborhood, even in the slow market. “Younger people are living in the city again,” he said. “They want the amenities close by.” With these demographic trends and the company’s long view, Friedman’s commitment to River North looks like a good investment that will continue to grow over time. 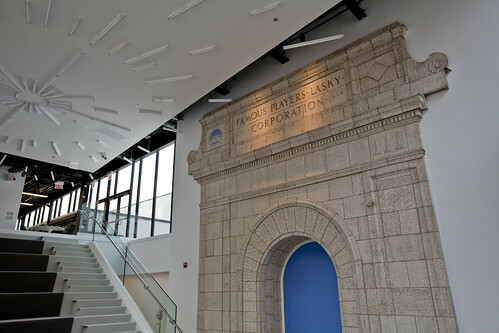 In January, the small, design-oriented firm Brininstool + Lynch, best known for the Racine Art Museum, announced it was going after larger-scale, international projects with a new partner and a new partnership with a developer. The firm, now called Brininstool, Kerwin & Lynch (BK&L), has brought on SOM veteran Thomas Kerwin, who has experience with a number of major international projects, including the Greenland Financial Center in Nanjing, China and the Rockwell Center in the Philippines. The firm has received investment from Magellan Properties, the developer of the Studio Gang–designed Aqua tower, and will be collaborating with Magellan as they pursue new work at home and abroad. Meanwhile, since January Adrian Smith + Gordon Gill Architecture (AS+GG) has added two new senior staffers, and this week announced they would create a new firm, PositiveEnergy Practice, with Roger E. Frechette, a mechanical engineer also formerly of SOM, as president. 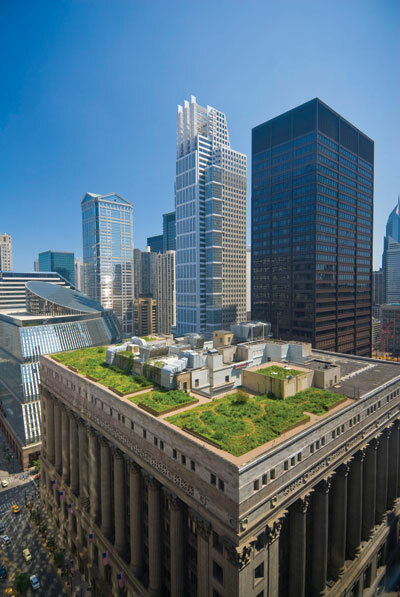 PositiveEnergy grew out of the research AS+GG did to develop a “decarbonization” plan for Chicago’s Loop, part of the firm's broader interest in sustainable designs. “We started off trying to figure out what the 2030 Challenge means,” Smith told AN, referring to the emissions reduction goals being pursued by many in the building industry. “We saw how difficult it was going to be to meet those goals.” Smith thinks developing emissions reduction strategies will be an important new business opportunity. In addition to Frechette, AS+GG has also added Peter J. Kindel, an architect, landscape architect, and planner who will lead the firm’s urban design team, and Dr. Christopher Drew, a zoologist and energy expert, who will lead the sustainability team. Dr. Drew was previously the department manager for Masdar City, the zero-carbon development under construction outside Abu Dhabi. According to Lynch, BK&L is hiring one or two new people, but plans to remain lean. “We’re starting out small, and we’d like to be, at most, a medium-sized firm,” Lynch told AN. “It’s an opportunistic move. I think it shows that we’re taking a step forward.” BK&L recently moved into a new office space in Aqua. 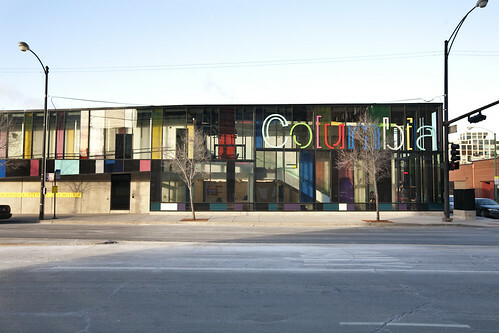 With project's like the Gary Comer Youth Center, designed by John Ronan Architects, and the SOS Children's Villages by Studio Gang, Chicago's South Side has some of the most exciting non-profit institutional architecture in the country. Chicago Magazine takes an in-depth look at one project that has had a decidely bumpier ride, the Ray and Joan Kroc Corps Community Center, once planned for Bronzeville in an Antoine Predock-designed building, now destined for West Pullman in a less ambitious piece of architecture designed by Antunovich Associates (above). The piece lays out in detail how in 2004 the project was scuttled when then Alderman Dorothy Tillman vetoed the project, saying she wanted a shopping center on the site. 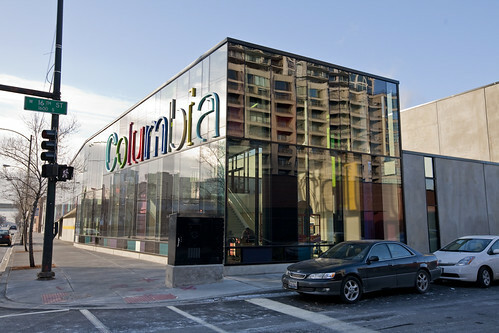 The project was then relocated to West Pullman, with a slightly less expensive design by Murphy/Jahn. 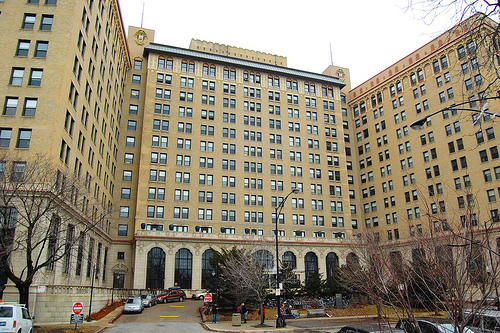 When that design proved too expensive, the client, the Salvation Army, looked at four Chicago firms, not named in the piece, and ultimately chose Antunovich. Even with the more modest design, the project boasts a number of green amenities, including a green roof and solar panels. Ronan and Gang have shown you can get great design on a tight budget. 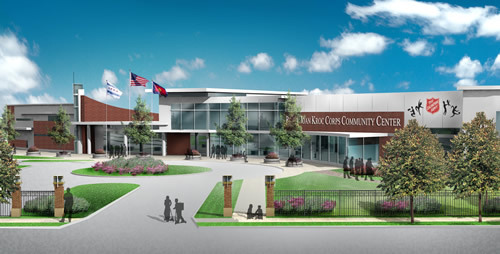 Even if the Kroc Center won't be a destination for architecture buffs, the project will improve the quality of life for young people in the neighborhood. Construction on the center is expected to begin in the next few months. The undulating balconies of Studio Gang's Aqua improve views, provide sun shading, and buffer the tower from wind loading, eliminating the need for a tuned mass damper. One of the top selling points of an all-glass, highrise condo is views, a factor that can be seriously challenged when the highrise is surrounded by other tall buildings. 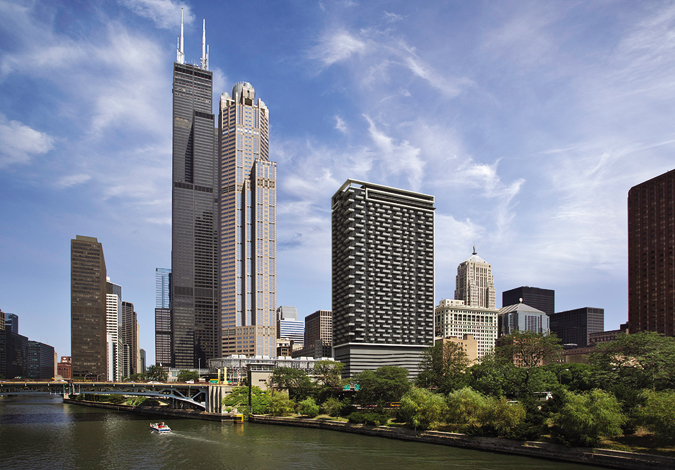 In its design for Aqua—an 823-foot-high, 1.9 million-square-foot tower next to Chicago’s Lake Shore East Park—Studio Gang found an innovative solution to this familiar snag. 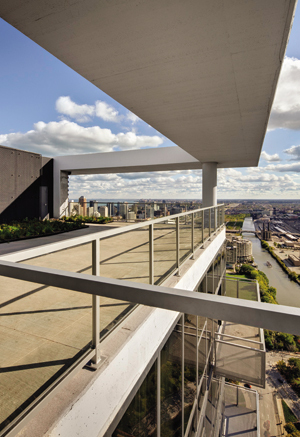 The firm extended the floor plates out past the building envelope, creating terraces that open up sightlines around adjacent structures to specific landmarks: Anish Kapoor’s Cloud Gate sculpture, Navy Pier, Lake Street, and more. Rather than plain belts ringing the volume, the architects used the terraces to create an undulating pattern up the facade. The balconies cut an interesting profile not only from afar but upon them as well. 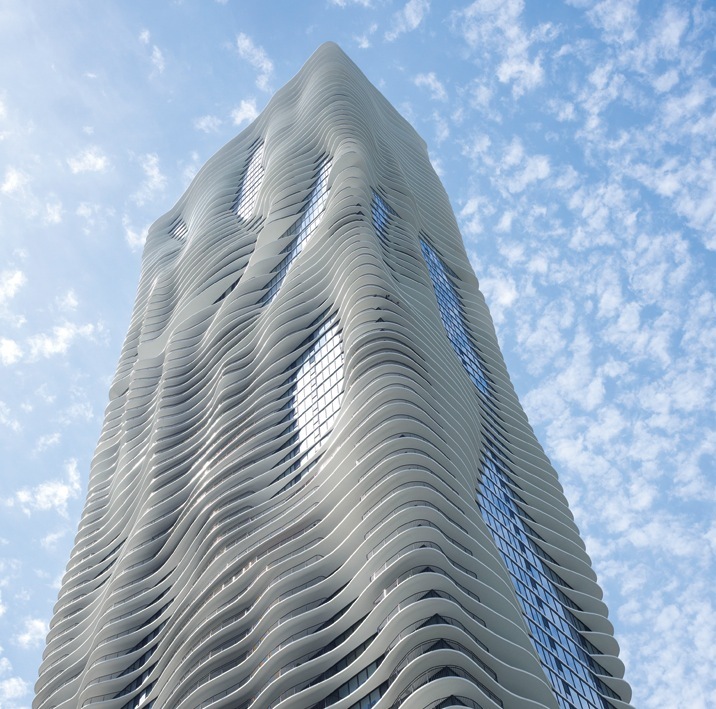 In addition to acting as a rather effective view machine, Aqua makes for some intriguing eye candy on the skyline. When viewed from afar, the tower appears slim and rectilinear. Up close, however, the wavy forms of the terraces reveal their depth, and the topographical nature of the elevation becomes apparent. But image isn’t everything that the design delivers. The protruding floor slabs also have an effect on the building’s systems. The structure—engineered by Magnusson Klemencic Associates—is reinforced concrete, which offers a good deal of rigidity, but at this height and with this use (the building will contain rental apartments and a hotel, as well as the condos), it was assumed that a tuned mass damper would be necessary to combat sway. 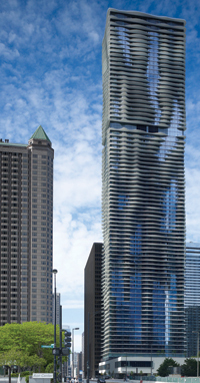 In a tall town like Chicago, the Aqua's facade helps it stand out from its skyscraping neighbors. However, wind tunnel testing revealed that the terraces, which cantilever as much as 12 feet out from the perimeter columns, cut wind loads enough to ensure stability. “We sensed that the design would reduce the wind, but we didn’t know for sure until getting the modeling done,” said Gang. This buffering effect will also make the terraces hospitable in a city notorious for its windy days. The architects designed around the microclimates created by the slabs on the facade, specifying five different types of glass depending on the amount of sun each panel would receive. All of the glass is low-e coated, but the material placed behind the terraces is extremely clear, whereas the material in the portions of the facade where the slab does not protrude—areas that the architects call pools—has a very reflective high-performance coating. The Beursplein in Rotterdam, designed by the Jerde Partnership, won an AIA Honor Award in 1997. Where a postwar traffic artery had split downtown in two, the plan placed a pedestrian street under glass canopies, with a 30-story apartment tower and metro station to help resurrect the neighborhood. A precise definition of urban design is elusive, as it has been since the term’s first articulation over 50 years ago at a Harvard GSD conference spearheaded by José Lluis Sert. Today the term, like sustainability, is batted about by architecture firms and the media, pointing toward an interpretation that favors architects and their super-sized projects. While practitioners of the quasi-discipline are typically seen to fall somewhere between planning’s public policy and architecture’s formal concerns, the urban designer’s role in the process of development is often misunderstood and many times questioned. Urban Design for an Urban Century sets itself the task of clarifying the role of urban design in shaping urban places. The book is the product of New York–based professor and practitioner Lance Jay Brown, David Dixon of Boston-based Goody Clancy, and the late architect and planner Oliver Gillham. The authors begin the book by acknowledging the ambiguity of the urban designer’s job, determining that a shared emphasis on “finding the right fit between people and place” predominates. To illustrate this thread, they collect all 70 winning projects of the AIA Institute Honor Awards for regional and urban design over the last ten years, commenting on these with respect to principles such as building community, advancing sustainability, expanding individual choices, enhancing public health, and making places for people. Case studies are grouped into seven areas: regional growth, downtowns, older neighborhoods, new neighborhoods, waterfronts, the public realm, and campuses. It is clear from these divisions that one long-held purview of the urban designer, the public realm, is not the sole area of concern. 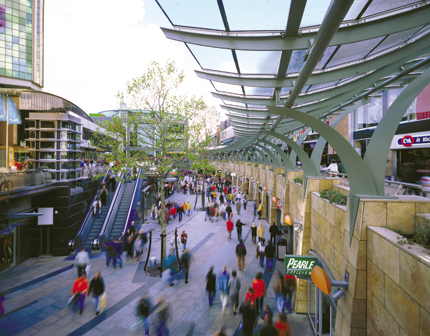 Streetscapes and plazas and their accessory elements like furniture, signage, and trees are still addressed by urban designers, but so are land use, bulk, density, form, transportation, and ecology. Much of this expanded scope normally falls to planners and local jurisdictions, suggesting the urban designer’s role in giving form to public policy and private development at an early stage. 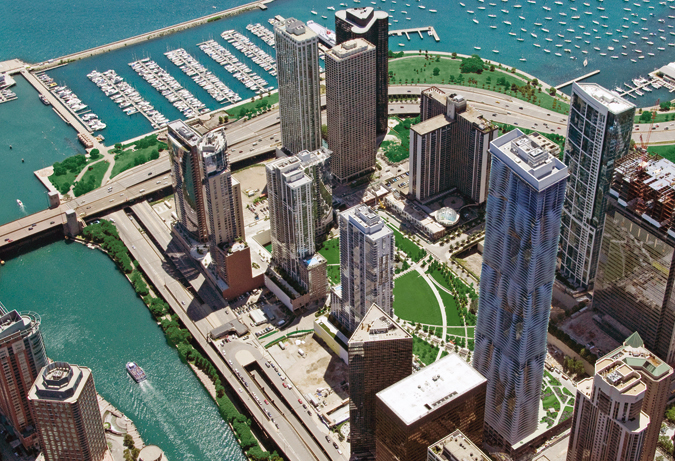 Chicago’s award-winning Lakeshore East Master Plan by Skidmore, Owings & Merrill (SOM) is a fitting example of urban design’s malleability. The plan is a guideline for future action by other actors, namely architects and their clients, following developed rules of land use, massing, and site coverage. Most notable among these is Studio Gang’s 80-story Aqua Tower, a design marked by undulating terraces hardly foreshadowed by SOM’s Rockefeller Center–esque imagery. Preceding the case studies and principles are an excellent, concise history of urban morphology and the decentralization of cities; a call for recentralization, echoing Sert’s assertion for the same a half-century ago; and finally, the authors’ crack at defining urban design. To that end Brown, Dixon, and Gillham’s definition outlines three characteristics: multi-disciplinary collaboration, outreach to stakeholders, and the enhancement of economic, social, and environmental realms. 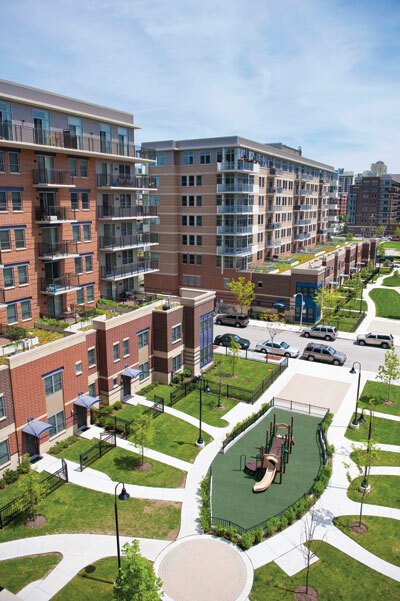 These broad concerns insufficiently portray what an urban designer actually does, but a review of the case studies points to placemaking generated by buildings, particularly via their form, size, and style. But instead of falling prey to ever-popular form-based codes, the authors attempt to steer the reader away from aesthetics and toward sustainability, social equity, the health of the common realm, and other concerns. Defining urban design is difficult primarily because the discipline has one foot planted in policy and the other rooted in physical form. The pull one way or the other depends upon the actual situation in which the urban designer works. 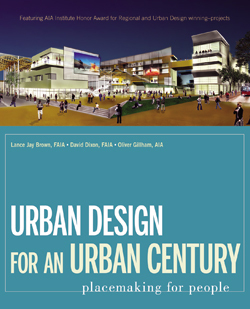 Kevin Lynch’s assertion, quoted in the first chapter, that urban design “comes down to the management of change” points us in the right direction. Attentive to the impact of policies on a diverse public and equally to design’s role in placemaking, urban designers are able to synthesize the competing forces shaping cities today. Ideally, with an emphasis on process and change, many of the traditional concerns found here will give way to issues like questioning consumption’s role in the social life of cities, and our relationship to nature and its processes. Brown, Dixon, and Gillham are aware of the need for social and ecological balance, but their admirable book-length explication remains grounded in practice, as are the case studies that compensate in diversity for what they lack in vision.